This kitchen theme is all about practical and classy use of wood in its natural shades with veneered doors and built in handles. 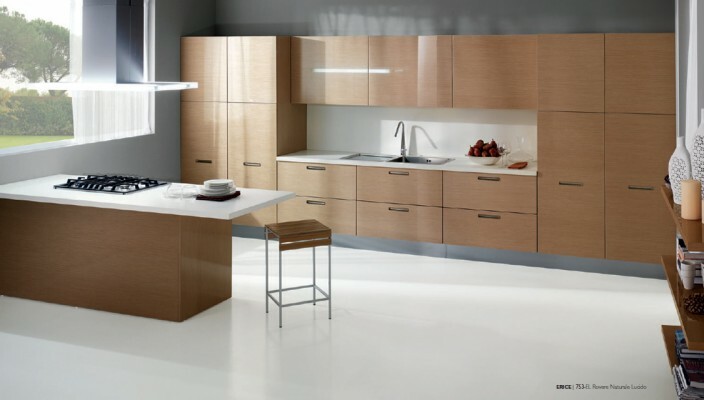 This conventional and practical design includes the smart use of wood in modern kitchen in a new style. The veneered doors have built in handles, while the entire design is keeping the essentials under the cover. With most part of the wall is covered with cabinets, this design appeals universally to almost all interior design theme mainly because the natural color of wood has been maintained at its best. The countertop in white only creates a balance in a subtle way!